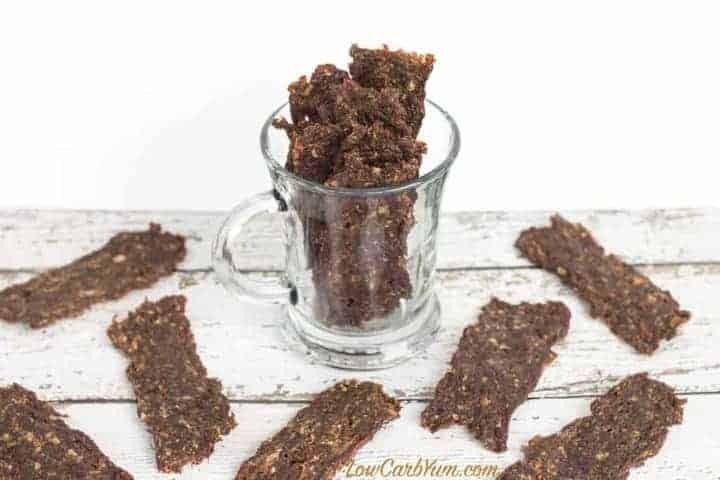 Here’s a quick and easy ground beef jerky recipe that can be made with or without a jerky gun. Simply season the meat, press into thin strips, then dehydrate. 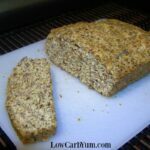 A perfect low carb snack! 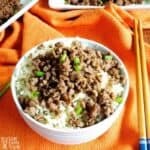 We all know that meat is a perfect low carb keto snack because it has zero carbs. However, most commercially prepared beef jerky is prepared with marinades using sugar so carbs can add up. We love homemade jerky, but hate the time it takes to slice and soak in marinade. That’s why we make ground meat jerky now. 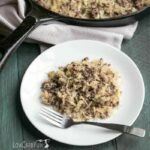 It’s so quick and easy to prepare! 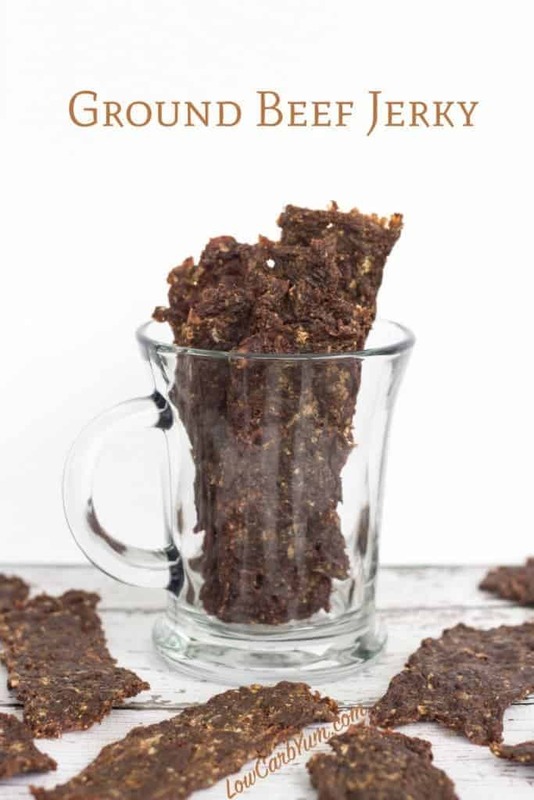 In this post, I’ll show you the method used for my ground beef jerky recipe. It’s really easy to do and you don’t need any special tools or equipment. My husband is a serious deer hunter and his favorite way to eat the meat is venison jerky. We used to spend hours slicing up the meat for jerky. It was so time consuming that I rarely made jerky more than once or twice a year. We grind up most of the meat because I prefer eating venison ground. So, I came up with this ground beef jerky recipe to make our own ground venison jerky. 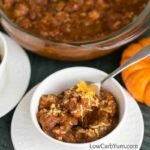 The method uses a dry seasoning blend that requires no slicing or marinating. This saves tons of time when it comes to making jerky! Now, I don’t mind making jerky every few weeks. It literally takes less than a half hour to mix the meat with seasoning and lay it out on trays. The time it takes to dry in my dehydrator is less than 8 hours. So it’s easily started in the morning and enjoyed in the afternoon! 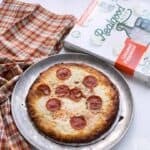 Although a jerky gun is not required to for making jerky out of ground meat, it is definitely preferred. Using the tool makes it a lot easier to form the strips. I own an inexpensive jerky gun by Presto which I picked up at a kitchen store in a local mall. But there are much better ones on the market if you are willing to spend a little more money. 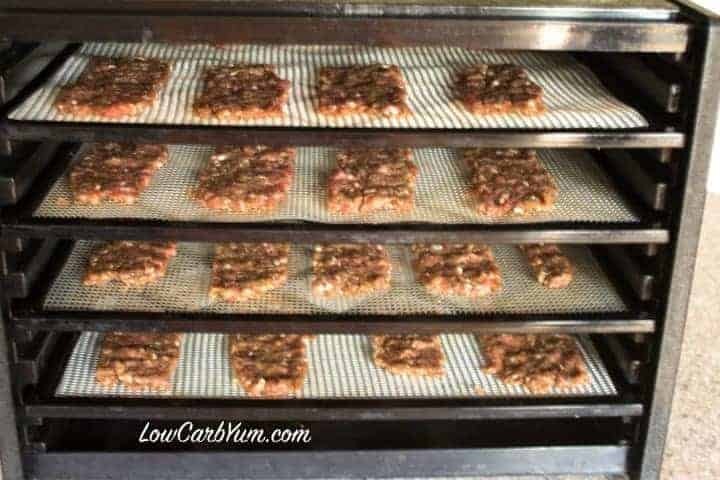 The great thing about using the jerky gun for the ground beef jerky recipe is that you can press the strips right onto the dehydrator tray. If you don’t have a jerky gun, you’ll need to roll out the meat mixture into a thin layer and then cut it into strips. Then, you’ll have to move the strips carefully onto the dehydrator trays. Our dehydrator is very large so next time I’ll make a double batch. 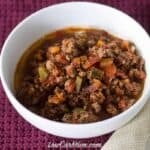 I used about 3 pounds of ground venison for this recipe and it only took up about half of my large Excaliber dehydrator. The prepared jerky can be stored for months in the freezer so no worries about having to eat it all within a week! 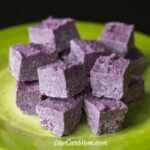 And, it’s one of my favorite portable keto snacks for taking on the road. 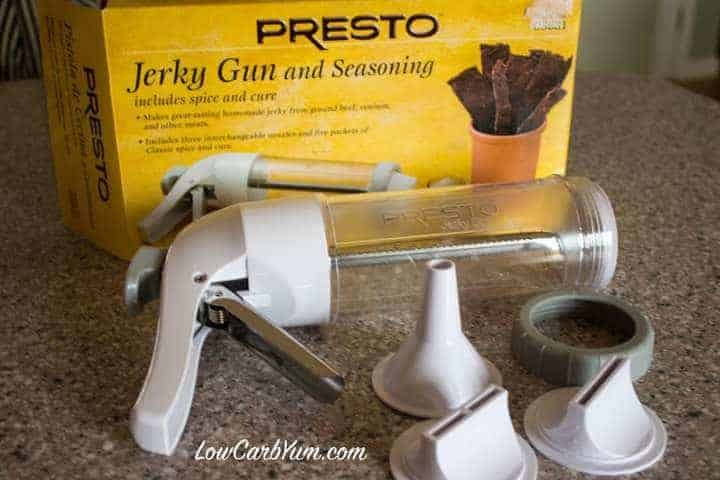 If you are looking for a quick and easy way to make low carb beef jerky, use a jerky gun with seasoned ground meat. 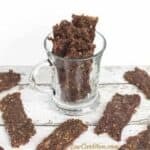 This ground beef jerky recipe requires no marinating because the seasoning is blended into the ground meat. That alone saves hours since you don’t have to wait for the marinade to soak into the meat. It also saves time in the dehydrator because the meat isn’t dripping wet from the marinade. 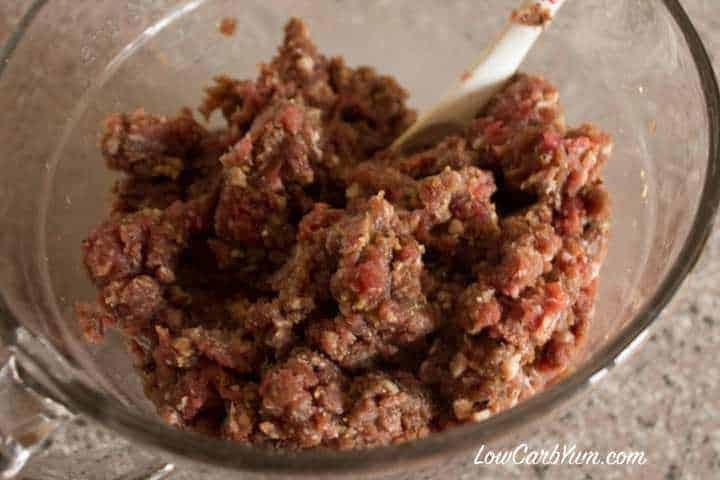 Now that we know how to make ground venison jerky, you can bet we will be making all our jerky with ground meat from now on! 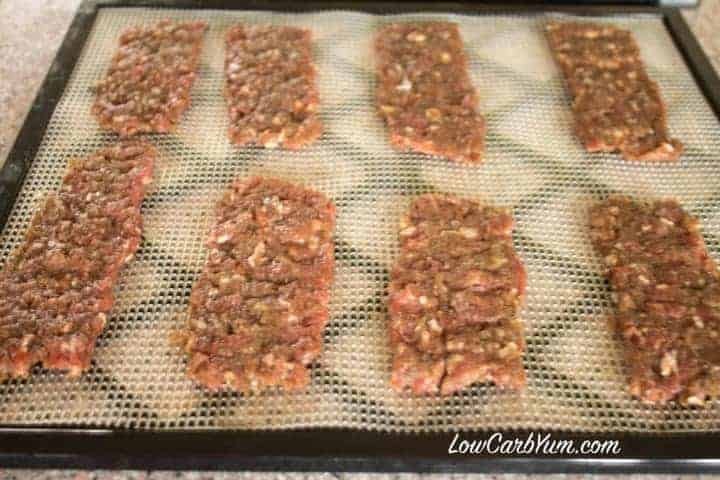 Here's how to make ground beef or venison jerky with or without a jerky gun. Simply season the meat, press into thin strips, then dehydrate. 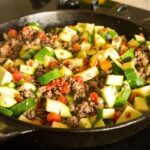 A perfect low carb snack! Using a jerky gun, press thin strips onto dehydrator racks. Or, roll thin between parchment paper, cut into strips and place on racks. Dehydrate for 7-12 hours until dry and crisp. 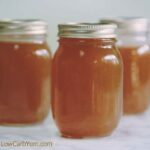 Store up to 7 days in refrigerator or freeze for longer storage.